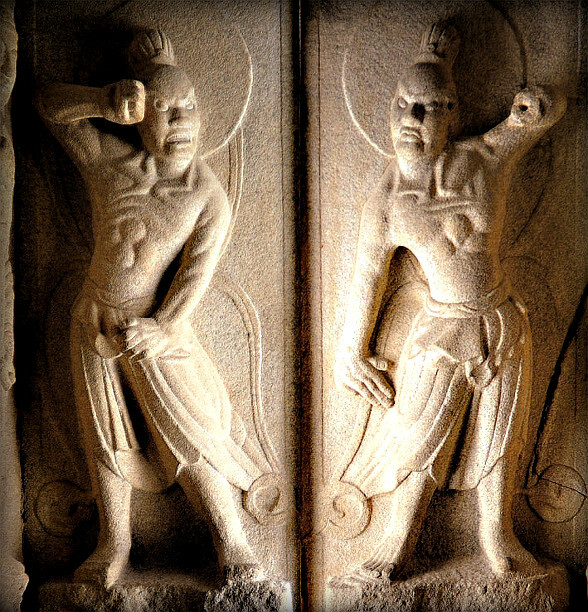 In primitive times all cultures used traditional unarmed combat skills when fighting tribal wars and as self-defense against animal attacks; these methods eventually developed into unique hand and foot skills. Koguryo (Goguryeo) 37 BC-668 AD. Many relics of Tang Soo Do (Soo Bahk Kee) from this era survive to the present day. One of the best known examples is the Koguryo wall painting depicting martial arts, which is at least 1500 years old. It was found in Jip Han Yern, on the lower part of the Ap Lok river which forms part of the border between Korea and China. 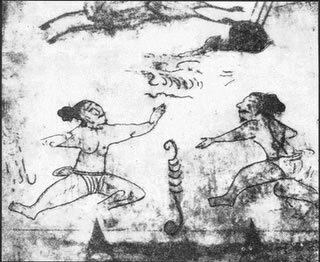 Koguryo murals of the royal tomb reveal the lifestyle of the time; one of the murals excavated during the period 1935-40 depicts a scene in which two warriors are engaged in a hand to hand fighting in Tang Soo Do. Up until the end of Yi dynasty (1907) there were many styles of this art practiced in Korea. Native Korean martial arts were banned during the period of Japanese occupation but survived through underground teaching and folk custom. The modern development of Tang Soo Do is heavily indebted to Grand Master Hwang Kee who formed the Moo Duk Kwan (Korean Martial Art Academy) on 9th of November 1945. Grand Master Kang Uk Lee, now 10th Dan and one of Grand Master Hwang Kee's most senior students, introduced Tang Soo Do to the United Kingdom and South East Asia in the early 1970s. His inspiration and guidance were instrumental in the increase in popularity and development of Tang Soo Do in Europe. The following is an account of how Grand Master Hwang Kee set up the modern Tang Soo Do organisation and how it evolved into a global organisation. Kwan Jang Nim Hwang Kee was born on 9th of November, 1914. His first contact with martial arts was at the age of 7 when he witnessed a man defeat several attackers with various hand and foot movements. He then followed the man home and from a distance he attempted to copy the movements. One day he plucked up the courage and asked the man to teach him but was refused on account of his young age. Nevertheless, he could not forget this experience and continued to practice what he had seen. In May 1936 he was working for the rail road company in Manchuria and he met a Chinese Master Yang, Kuk Jin. After several requests a friend, Mr Park, and himself were accepted as students. Another major development of Tang Soo Do is the twisting of the hip, the hip twist allows for much more power to be generated into every move. Grand Master Hwang Kee recognised this and such every move in Tang Soo Do features this hip twist, one key idea is that less you do and the bigger the effect the greater the accomplishment. This can be seen in the hip twist, a tiny movement with massive power. After the end of World War Two in 1945 Grand Master Hwang Kee founded the Moo Duk Kwan school which means “Institute of Martial Virtue”. It was his aim to better peoples lives through martial art. He had a philosophy which brought together the Taoist view of nature (there is an interdependent relationship between all things); the virtue of Buddhism and the conduct of Confucian ethics (ancestors and deities, the etiquette of daily behaviour and social and political institutions). Central to this theme were the basic principles used by an elite warrior corp. and created by a Buddhist monk many centuries before. He too believed that the martial artist should be a scholar. Hwang Kee first used the name “Hwa Soo Do” to describe his art, unfortunately this was unsuccessful. At the beginning of 1947 he started to teach Tang Soo Do (Moo Duk Kwan, Tang being a more widely known term in Korea). However on the 25th of June, 1950 the Korean War began. Grand Master Hwang Kee had to move his training further south of Seoul, he taught at Cho Ryang train station in Pu San city during 1951. After the end of the war, in 1953 he returned to teach in Seoul, by May 1955 he was able to lease a building in front of the central station which became the legendary “Joong Ang Do Jang”. Grand Master Hwang Kee then began to develop the art scientifically by incorporating the twisting of the hips with each move to increase its effectiveness. The police, schools and the military all sought instruction of Tang Soo Do and as a result of this the number of Do Jangs grew all over Korea. The Moo Duk Kwan system was also taught at the Naval and Air Force Academy of Korea, around this time the art was in constant demand by American servicemen in the region. In 1957 Grand Master Hwang Kee came across the Moo Yei Do Bo Tong Ji. It is the oldest and most valuable historical documentation of the ancient Korean art known as “Soo Bahk”. He then spent many years interpreting the text to understand its meaning. On the 30th of June, 1960 he incorporated Moo Duk Kwan as the Korean Soo Bahk Do Association as the traditional martial art of Korea. In May of 1961 there were discussions of unifying all of the Kwan styles in Korea under one name. The Moo Duk Kwan was the most successful of the Kwans and it was proposed that the Moo Duk Kwan should have 3 of 21 seats on the board of directors and that the new name would be known as Tae Kwon do. Tang Soo Do had not been considered as it has Chinese connotations (Tang refers to the Chinese Tang Dynasty (June 18, 618 – June 4, 907) and translated means way of the China Hand). Tang Soo Do is the Korean pronunciation of the Chinese characters 唐手道. Tang Soo Do literally means "Chinese hand way". Outside of the far east, the term "Tang Soo Do" has primarily become synonymous with the Korean martial art promoted by Hwang Kee. Grand Master Hwang Kee refused to take part in the unification process as he felt that Soo Bahk Do was the traditional martial art of Korea. Increasing pressure was put on Soo Bahk Do and many remaining members moved over to the newly formed Tae Kwon Do. Attempts were made to shut down the Soo Bahk Do Association. In 1965 Grand Master Hwang Kee made legal proceedings against the Korean government in the high courts of justice. He won the lawsuit in November 1965 and the Soo Bahk Do had an ensured future however the government continued the fight in the supreme courts in January of 1966. In the June of 1966 the courts ruled in favour of Grand Master Hwang Kee and he was the victor once again. This would allow him to run his organisation without interference and thereby work to rebuild his organisation. By the 1970s sanctions were eased and Moo Duk Kwan schools were established in the UK, USA, Greece, Germany, France, Belgium, Italy, Switzerland, Netherlands, Puerto Rico, Argentina, Malaysia, Brunei and Australia. The United Kingdom Tang Soo Do Federation was established in 1974 as a designated branch of the Korean Soo Bahk Do association. It was headed by Master Lee, Kang UK then a 7th Dan. He was promoted to 8th Dan in 1979 and later formed his own organisation in 1989.